If you want to take Amtrak to Reno, you will be using their California Zephyr Line. The Zephyr runs from Emeryville (across the Bay from San Francisco) all the way to Chicago. The small section of the route that goes from the Emeryville station to Reno, Nevada across the Sierra Nevada Mountains in California is a one-day journey through some of California's most dramatic mountain scenery. In that single day, you will travel from sea level to almost 7,000 feet high. You'll follow the Sacramento River through the Delta, climb into the Sierras and zip back down to Reno (which is still 4,500 feet high) along the Truckee River. It's a spectacular day of sightseeing with the luxury of not having to worry about road closures, traffic jams, or weather reports. It's also a trip that you may never forget, one that has been listed as part of the most beautiful train journeys in the U.S. The trip will take you most of a day, and it's all in daylight. You can do it as a one-way trip, returning by air from Reno the same day. That's how I did it, and I was glad I did. For me, one day on a train was enough. You could also stay to check out the "Biggest Little City" before you go home. If you want to travel both ways on the train, you will need to stay overnight in Reno. To find out what you can do while you're there, check out this guide to What's Great About Reno. The first section of the ride from Emeryville runs beside the San Francisco and San Pablo Bays. You'll travel near the water's edge where you can see wading birds, abandoned piers, fishermen, and a few industrial buildings including the C&H Sugar plant in Crockett. After the train crosses the Sacramento River at the Benicia Bridge, you'll travel through the Sacramento River Delta toward Sacramento. It's a flat landscape filled with agriculture and marked by the occasional marsh. On the nearby river, the Deep Water Ship Channel allows cargo ships to travel more than 70 miles inland to the Port of Sacramento. Sacramento is still in the flatland at 30 feet elevation. The former terminus of the Pony Express and western starting point for the Transcontinental Railroad has been California's state capitol since 1854. The climb to the route's highest point starts at Auburn, which is still a mere 1,227 feet high. Auburn is the heart of California's Gold Rush Country, just south of Sutter's Mill. That's where prospector James Wilson Marshall found the shining nuggets that set off the Gold Rush that propelled California to world fame. By the time you reach Colfax just 20 miles away, you'll be at 2,400 feet. The stop is short, but even from the train, you can see echoes of the past in its scenic downtown area. From there, the train goes through wooded areas. It slips in and out of short tunnels and ducks under snow sheds that protect the track from the more than 30 feet of snow that fall in an average year. If it's winter when you ride, you'll start to see hints of snow, and by the time you reach Emigrant Gap, the landscape turns white. As you approach Emigrant Gap, you will be heading toward Donner Pass, elevation 7,057 feet. It's not the highest pass in the Sierras, but it may be the most infamous. It's the place where California-bound settlers got stranded in 1846 with disastrous results that included incidents of cannibalism. You can read an account of their sad story at Eyewitness to History. The train track runs above the American River Canyon, which is 1,500 to 2,000 feet below. The ski lifts of Sugar Bowl Resort pass overhead just before you reach Donner Lake and Donner Pass. The tracks reach their highest point (6,997 feet above sea level) just after Sugar Bowl as the train enters a two-mile long tunnel through Mt. Judah that is sometimes called the Big Hole. From there, it's a fast descent toward Truckee and on to Reno, following the Truckee River. When you get to Reno, you can take a short Uber or taxi ride to the airport, or you can find casinos and hotels within walking distance of the train station. If you have never traveled on a train before, you may be wondering what it's like. These are some of the things I learned while getting ready for my trip, and while on it. The Emeryville Amtrak station is decidedly utilitarian, with a coffee stand, bottled drinks, and snacks, but no hot meals. If you plan to take food with you, pick it up before you get there. Seating is pretty much what you would expect, with big windows that make it easy to see out. You can also sit in the observation cars, which provide a more panoramic view. Their seating is limited, and they're often full. On the California Zephyr eastbound, volunteers from the railroad museum in Sacramento come on board to provide commentary, but you can only hear them in the observation car. If you eat a meal in the dining car, you will be seated with other travelers. Meals are included in the fare price for roomettes and sleeping compartments. Otherwise, many riders suggest bringing your own food to save money. The restrooms are a lot like what you would find in an airplane, complete with that same "whoosh" flushing sound. To reach roomettes and upper-level sleeping compartments, you will have to climb narrow, steep stairs. Accessible space is available but limited, and you should reserve ahead. When I rode in early 2017, the California Zephyr did not have WiFi service. You can check whether that has changed on the Amtrak website. The highest point of the trip is about 7,000 feet above sea level. You will be above 2,400 feet for about three hours. If you're concerned about motion sickness, I was, too, but I didn't experience it. If you are extremely sensitive, especially when looking out the side window of a car, you might want to be prepared. The California Zephyr is a non-smoking train. You can get out for a quick smoke only at some stops, and it's a four-hour ride from Sacramento to Reno with no smoking stop. If you're going to Reno from San Francisco, your trip will begin on an Amtrak bus that will take you to the Emeryville station. 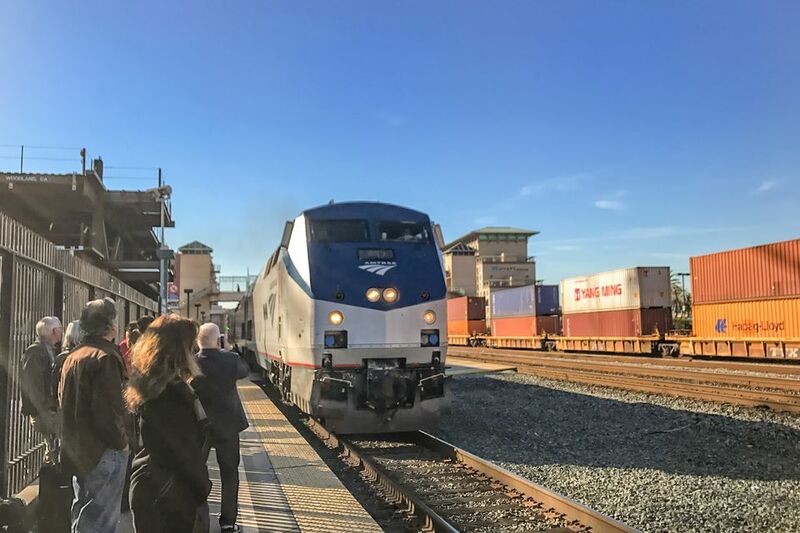 From San Jose, you can take the Capitol Corridor route to Emeryville and transfer to the California Zephyr, or you could drive to the Emeryville station. If you start from Emeryville, Martinez, Davis, Sacramento, Roseville, or Colfax, you can get onto the California Zephyr at the local station. The Zephyr also stops in Truckee, but by then you're over the mountains and will miss most of the scenery. I'm sharing my Google map of the California Zephyr stop here, so you see where the stops all are. Getting to the California Zephyr from LA's Union Station is complicated. It requires transfers and a minimum three of buses or trains and takes about 12 hours. The trip from San Diego is equally difficult. Your most scenic option would be to take the Coast Starlight to Santa Barbara, then an overnight bus to Emeryville. You can get your tickets on the Amtrak website or by using their free app. You can get an eTicket delivered to your mobile device. It will arrive as a PDF attachment to your e-mail receipt, and you can show it to the conductor. You can also print the PDF if you want to. Amtrak offers bus services as well as train trips. When making your reservation, pay special attention to be sure you don't end up on a bus when you wanted to cross the mountains on the train. AAA members get a discount. You'll need to show your AAA membership ID card when you pick up your ticket, and you'll have to carry the card with you onboard the train. Anyone over age 62, active military and military veterans get a discount, but you may need to prove your eligibility. Looking for coupon codes may not be worth your time. The only discounts I found in 20 minutes of searching were the ones already available on the Amtrak website. You can carry two personal items and two suitcases on board with some size and weight restrictions. They offer checked baggage service on some trains if you have more than that. Amtrak's California Zephyr and Coast Starlight lines are pet-friendly, but the Capitol Corridor between San Jose and Emeryville is not. You can take food and beverages to eat at your seat, but if you go to the dining or lounge car, you can only consume what you buy there. If you're in a sleeping car, you can bring alcoholic beverages, too. One child under the age of two can ride for free with each fare-paying adult (who is more than 18 years old). They must ride on the adult's lap unless vacant seats are available. If more than one child is traveling with just one adult, the rest of them will need a ticket, no matter how old they are. The adult must be at least 18 years old. Passengers 13 to 15 years old can't travel alone. You can find the current refund policy on the Amtrak website. It includes information about how refunds are issued, how far in advance you need to cancel and cancellation fees. Key Holidays runs a couple of themed train rides on the California Zephyr using a private car. Their round trip packages include overnight lodging in Reno. You can take their Reno Fun Train which they say is the only train in the world where you can dance, relax and let loose while riding the rails over the Sierra Nevada Mountains on the way to exciting downtown Reno. They also run a Sierra Scenic tour on weekdays which is a family-friendly trip with onboard entertainment, live music, and historical narration. Visit their website for dates and rates. Is Taking Amtrak to Reno for You? If you're trying to decide whether this trip is for you, these are some facts and things to think about. The train trip from Emeryville to Reno takes about 7 hours. It stops at six stations along the way. Driving the same route takes about 4.5 hours when there are no weekend traffic jams going to Lake Tahoe, and no snow restrictions. A non-stop flight from Oakland to Reno takes about 1 hour 15 minutes. Allowing for early airport arrival to check in and time to collect your bags on arrival, your total trip time would be about 3 hours. If you drive your own automobile, you'll pay for gas to cover about 210 miles. You may also need to carry chains if you're traveling in the winter. These are the rules about snow chains in California. A one-way trip on the California Zephyr from Emeryville to Reno costs just a little less than a one-way flight from Oakland to Reno (if you buy your air ticket about a month ahead of time). You'll pay more for a roomette on the California Zephyr, but the most compelling reason to take this trip by Amtrak is for the outstanding scenery. To ensure that you can see it without having to peer out the window across a total stranger, I think it's best to get a reserved window seat or a roomette. The cost of the roomette is about three times a coach seat but includes a meal. You can see the same scenery by driving to Reno on I-80. But on the train, you won't get into traffic jams that build up when winter skiers are trying to get to Lake Tahoe. And you won't have to worry about snow chains or hazardous driving conditions. If you are carrying a lot of baggage, the train may be a better option than an airplane. You can carry on two bags weighing 25 lbs each and check two more. And they charge a reasonable price for extras after that.